From Downhill CNC Skateboard/Longboard trucks to Pumping/Carving Skateboard trucks – its all here! Bear Grizzly 852 Black 181mm Trucks are one of the most versatile trucks on the market. Landyachtz have kept the production quality high with these trucks.The trucks are cast using a special casting formula to maximize strength. The 181mm axle width along with a 52 degree baseplate, is optimum for all round longboarding. The hanger can also be flipped, changing the angle of the hanger. Doing so with the 52 degree baseplate turns the truck from a general carving truck, to a more downhill oriented truck. Specialised Casting Formula – Completely new metal formula, the most reliable aluminum alloy on the market. The alloy has been specifically mixed for our trucks and not pulled from some generic melted down block. Each batch is pre tested and approved at our factory before shipping out. Effective bushing Seat – Fully-wrapped leaning system with bushing base lock-in. This allows extra lean and no turning restrictions and is compatible with most bushings. Bear Grizzly 852 Blue Fade 181mm Trucks are one of the most versatile trucks on the market. Bear Grizzly 852 Atomic Orange 181mm Trucks are one of the most versatile trucks on the market! 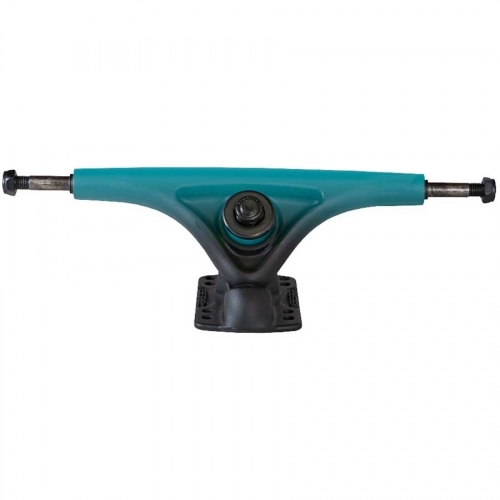 Bear Grizzly 852 Matte Green 181mm Trucks are one of the most versatile trucks on the market. Bear Grizzly 852 Matte Red 181mm Trucks are one of the most versatile trucks on the market. Bear Grizzly 852 Purple 181mm Trucks are one of the most versatile and recognisable trucks on the market. Bear Grizzly 852 Stripes 181mm Trucks are one of the most versatile trucks on the market. Bear Grizzly 852 Tarmac Black 181mm Trucks are one of the most versatile trucks on the market. Bear Kodiak Forged Precision Black Trucks features the latest in truck technology. Forged Hangers and Baseplates provide the next level in strength and performance. Bear Kodiak Forged Precision Red Trucks features the latest in truck technology. Forged Hangers and Baseplates provide the next level in strength and performance. Established in 2010, Caliber Truck Co. quickly became one of the most recognised performance truck brands on the market. Quality, performance, and amazing content has put their products on the map and caught the attention of skaters around the world. The first trucks to market were their Forty-Four and Fifty reverse kingpin models. With help from top riders like Liam Morgan, Caliber rapidly became one of the most influential brands in downhill skateboarding. With the introduction of their Standard design, Caliber now has a truck for all skaters. Gullwing Charger 180mm Silver Trucks are a nice pumping/carving truck. The stock bushings give a nice smooth ride with great rebound. taken into consideration with this design. They are perfect for racing and free riding at maximum speeds. The hangers on these trucks are flipped, giving the ride a negative rake. Negative rake gives the rider extra stability for a fastest ride! The Gullwing Sidewinder 11 Aqua 9″ Trucks are designed to be the best carving trucks you’ll ever ride! Featuring Gullwing’s revolutionary double stack geometry with premium 89a cone and barrel combo bushings. This patented design of the Gullwing Sidewinder Trucks has been turning heads since they were first introduced. What makes these trucks so special is that they have two pivot points which allows the trucks to turn twice as sharp and fast as a standard truck. This double action pivot allows the rider to generate speed using their own turning momentum. The Gullwing Sidewinder trucks are a sidewalk surfers dream. Ask anyone that has ridden them and the truth will be told. A Guaranteed fun ride! The Gullwing Sidewinder 11 Black 10″ Trucks are designed to be the best carving trucks you’ll ever ride. Featuring Gullwing’s revolutionary double stack geometry with premium 89a cone and barrel combo bushings. The patented design of the Gullwing Sidewinder Trucks have been turning heads since they were first introduced. What makes these trucks so special is that they have two pivot points which allows the trucks to turn twice as sharp and fast as a standard truck. This double action pivot allows the rider to generate speed using their own turning momentum. The Gullwing Sidewinder 11 Lime 9″ Trucks are designed to be the best carving trucks you’ll ever ride! The Gullwing Sidewinder 11 Purple 9″ Trucks are designed to be the best carving trucks you’ll ever ride! The Gullwing Sidewinder 11 Silver 10″ Trucks are designed to be the best carving trucks you’ll ever ride. Featuring Gullwing’s revolutionary double stack geometry with premium 89a cone and barrel combo bushings. The Gullwing Sidewinder 11 Silver 9″ Trucks are designed to be the best carving trucks you’ll ever ride! If you already have Indy’s but are looking to upgrade to a lighter, more durable base plate, look no further than the Independent Forged 6 Hole Base Plate. Forged 6 hole Hybrid Baseplate. Converts any Independent Truck for downhill set ups that require larger kingpins. 6 hole pattern fits all decks; old and new. If you’re looking for stability on those supa’ fast runs, the 35 Degree Baseplate is perfect. Sporting the same ride-height as the original 42.25 Degree Baseplates but a lower turn-to-lean ratio, the 35 Degree Plates are recommended for downhill racing setups, especially as a rear baseplate with a higher-degree front baseplate. Lets go fast!!! Price includes one 35 Degree Baseplate with one pivot cup. The Paris 149mm Street Trucks are designed for hybrid longboarding and are ideal for larger double kick skateboards with wheels in the 60-70mm range. The high profile gives a higher feeling ride, but now there is no need for a riser. Like most traditional kingpin skateboard trucks, the Paris street trucks will have a lot of lean. Grab a set of these trucks if you plan on setting up a board with a short wheelbase or if you plan on setting up a board with a kick tail. The Paris Savant Dark Grey 43° 180mm Trucks has smooth lines and clean design you’ve come to know and love from Paris Truck Co. The Savant features many upgrades and downhill-specific improvements from previous V2 design. The Paris Savant Electro Lux 50° 165mm Trucks is smaller in size, but nothing short of perfection. The all new 165mm Savant trucks are everything you could dream of. With no compromise in strength or performance, the narrower hangers add more grip and control to any downhill setup. Snag those tight inside lines and rally harder than you ever have before with the 165’s bolted to your board. The Paris Savant Electro Luxe 43° 180mm Trucks have smooth lines and a clean design you’ve come to know and love from Paris Truck Co. The Savant features many upgrades and downhill-specific improvements from previous V2 designs. The Savant is the absolute perfect truck for fast downhill and freeride skating, able to handle the fastest and gnarliest terrain you can throw at them. The 180mm hanger is forged, not cast, for superior strength and tighter tolerances. The axles are dead straight, precision machined, and secured into the hanger with a patented axle lock system. A slightly tighter bushing seat provides the additional stability needed to take your skating to top speed, while still giving that deep and predictable Paris turn you expect from the trucks. The Paris Savant Electro Luxe 50° 180mm Trucks have smooth lines and a clean design you’ve come to know and love from Paris Truck Co. The Savant features many upgrades and downhill-specific improvements from previous V2 design. Paris Savant Red/Black 50° 180mm Trucks have smooth lines and a clean design you’ve come to know and love from Paris Truck Co. The Savant features many upgrades and downhill-specific improvements from previous V2 design. The Paris V2 43° Gold 180mm Trucks have a couple upgrades from the original Paris Trucks, which include a stronger hanger (less prone to bending) and more kingpin clearance in the bushing seat, allowing riders to carve more with much more ease and fluidity. They also have a new branded grade 8 kingpin to up the strength and steez factor. And to top it off they are now using a higher quality pivot cup for longer life and a smoother turn. If you have ridden Paris Trucks then you already know how awesome they are, but just imagine if they were 10 times better. They have a perfect lean to turn ratio, and with the stock 90a Divine bushings they are easy to control but still have plenty of response. The Paris V2 43° Silver 180mm Trucks have a couple upgrades from the original Paris Trucks, which include a stronger hanger (less prone to bending) and more kingpin clearance in the bushing seat, allowing riders to carve more with much more ease and fluidity. They also have a new branded grade 8 kingpin to up the strength and steez factor. And to top it off they are now using a higher quality pivot cup for longer life and a smoother turn. The Paris V2 50° Black 195mm Trucks are your go-to downhill truck. These were built with speed in mind and that is exactly what they do well! Like all Paris Trucks, the baseplate angle is 50°, which provides the perfect balance between manoeuvrability and stability. The 195mm hanger allows for less leverage when compared to a narrower hanger, which adds to stability and comfort at higher speeds. Where the heck is Adam Colton?!?! The man’s a mystery. Luckily we were able to dig up his old artwork and slap it on some trucks for you one last time! Back and better than before is The Adam Colton Signature Paris V2 Truck. If you missed them the first time, don’t miss out again! If you’re looking to cut some serious turns and get your carve on, then these babies are for you. The Paris 150mm trucks are your go-to carving truck. All Paris Trucks are built with 90a Divine bushings with the exception of the Adam Colton – The Adam Colton truck comes with 86a Divine Bushings. Like all Paris Trucks, the baseplate angle is 50 degrees, which provides the perfect balance between stability and maneuverability. The 150mm hanger allows for quicker turning and greater leverage when compared to a wider hanger. The Long awaited Paris V2 is here! This is the same beloved Paris design with some new upgrades and improvements! The Paris 180mm is the all-around and perfect any terrain truck. These are able to handle anything and everything you could possibly throw at them. The 180mm hanger is the perfect go-to size for most decks and compliments all riding styles. The baseplate angle is 50 degrees, which provides the perfect balance between stability and maneuverability. All Paris 50 degree trucks are built with 90a Divine bushings. The Paris V2 Blue Macaron 180mm Trucks are the all-around and perfect any terrain truck. These are able to handle anything and everything you could possibly throw at them. The 180mm hanger is the perfect go-to size for most decks and compliments all riding styles. The baseplate angle is 50 degrees, which provides the perfect balance between stability and maneuverability. All Paris 50 degree trucks are built with 90a Divine bushings. The Paris V2 Kittens 180mm Trucks are the all-around and perfect any terrain truck. These are able to handle anything and everything you could possibly throw at them. The 180mm hanger is the perfect go-to size for most decks and compliments all riding styles. The baseplate angle is 50 degrees, which provides the perfect balance between stability and maneuverability. All Paris 50 degree trucks are built with 90a Divine bushings. The Long awaited Pro Models are here! This is the same beloved Paris V2 design but with a personalized print, hand picked by the pros on this years line up. Available in Amanda Powell, Matt K, and Kody Noble designs. The Paris V2 Pink Macaron 180mm Trucks are the all-around and perfect any terrain truck. These are able to handle anything and everything you could possibly throw at them. The 180mm hanger is the perfect go-to size for most decks and compliments all riding styles. The baseplate angle is 50 degrees, which provides the perfect balance between stability and maneuverability. All Paris 50 degree trucks are built with 90a Divine bushings. Randal’s innovative design has sparked a completey new industry, and many others have followed suit with Randal’s revolutionary truck design. Randal has been making trucks for over 32 years (1978) now. Known for their strength and precision, Randal is referred to as the ‘standard’ in the reverse kingpin truck industry. If your looking for more stability on those downhill slopes, grab some 35 degree base plates! If your looking for more stability on those downhill slopes, grab some 42 degree base plates! Price is for 1 base plate. Randal R-11 150mm are for carving tight, quick turns while maintaining a stable geometry. They maintain stability at higher speeds, through turns and while pushing. The 50º base plates are designed for boards with longer wheel bases and the base plates and hangers are interchangeable within the Randal System. Randal R-II geometry allows for adjusting caster angle by flipping the hanger. Raked Hanger (Offset) – Raked hangers change the way you approach a corner. With a raked hanger, you can lean a lot further into a turn without the truck responding, but once you lean in far enough you’ll get a lot of turn, fast. Designed with racing in mind, raked hangers can give you added stability when making minor body weight adjustments on your board, but for the same reason the transition into a corner can be a bit jerky. Once you learn when the truck will engage into a turn, it will start to feel amazingly responsive. Because your wheels will be going straight for longer you will go faster! So if you can handle it, go for it! Randal R-11 180mm trucks are made specifically for longboard carving. Extended axle length and extreme pivot angle give this truck unique qualities for turning, but are very stable at speed. Randal R-11 180mm are made for carving tight, quick turns while maintaining a stable geometry. They maintain stability at higher speeds, through turns and while pushing. The 50º base plates are designed for boards with longer wheel bases and the base plates and hangers are interchangeable within the Randal System. Randal R-II geometry also allows for adjusting caster angle by flipping the hanger. Randal’s are made from virgin grade aluminum, have a grade 8 ‘cast in’ axle and incorporate a lightweight hanger design, with a grade 8 king pin. They come with a lifetime guarantee and are ‘Made in the USA’. Randal R-11 180mm are for carving tight, quick turns while maintaining a stable geometry. They maintain stability at higher speeds, through turns and while pushing. The 50º base plates are designed for boards with longer wheel bases and the base plates and hangers are interchangeable within the Randal System. Randal R-II geometry allows for adjusting caster angle by flipping the hanger. Randal’s are made from virgin grade aluminum, have a grade 8 ‘cast in’ axle and incorporates a lightweight hanger design, with a grade 8 king pin. They come with a lifetime guarantee and are ‘Made in the USA’. Its 186mm hanger and 48° baseplate give you a happy medium between stability and turn, while the combination of tall barrels and an insert bushing give you a smooth and consistent lean. Oversize .75″ Venom bushings for maximum lean and turn depth. Each set ships with 90a red in the trucks and one pack each of 93a green and 87a purple tall barrels to let you dial in your turn response. – Green 93a High Performance Formula insert bushing in the hangar controls slop for a precise, predictable ride. – The pressed-in steel “Traction Bar” through-axle is secured with a spring-loaded pin so it will never slip, unscrew, or come loose. – 43*/30* Baseplates (Both gold). – Green 93a Venom pivot cups. Ronin Cast 180mm Black/Black 42.5° Trucks bring the best in precision handling and ultimate build quality! The same engineering in a more affordable package. Completely inter-changable with their precision counterparts, the geometry is nearly identical, but these feature more rake for a quicker turn while retaining a lower (42.5º) baseplate angle for high-speed stability. Ronin Cast 180mm Black/Brick Red 42.5° Trucks bring the best in precision handling and ultimate build quality! Ronin Cast 180mm Black/Gold 42.5° Trucks bring the best in precision handling and ultimate build quality! Ronin Cast 180mm Orange/Blue 42.5° Trucks bring the best in precision handling and ultimate build quality! Ronin Cast 180mm Red/Blue 42.5° Trucks bring the best in precision handling and ultimate build quality! Ronin Cast 180mm Red/Raw 42.5° Trucks bring the best in precision handling and ultimate build quality! The Ronin Katana is the culmination of everything we have learned, experienced and accomplished up to this point as a team. Continuing with our trend of pushing the boundaries and tuning the trucks to perfection, the Katana has several updates that help make tuning and racing that much easier for you. Like the previous generations of Ronin Precision Trucks, Katana’s are guaranteed not to break or bend. There are 4 major changes to the truck, highlighting many months of testing, talking and podium results. First, we shortened the narrowest hanger width to 144mm. Despite popular belief, narrower is not less stable. What you get is a quicker turning truck that allows you to better apply your weight on the wheels. The cleaner you are through the turn, the faster you go, and narrower setups provide this. Due to the new narrow hanger width, we redesigned the axles. Still partially hollowed like our kingpins, they’ve become smaller to better fit the pro lite weight cutouts, becoming lighter themselves. We also beefed up the shoulder for better assembly and clearance for big race wheels. All width options will now be adjustable; 124-134mm, 134-144mm and 144-154mm. Our focus is on racing. Next, we gave the pivot more surface area and a tighter fit to help control lean progression and steering. This increases resistance on the pivot tube so that your bushings are not doing so much of the work, allowing you to run a wider range of bushing durometers. It also keeps the pivot tube tighter as it breaks in, so your parts feel better and last longer. Our most exciting update is the new bushing seat. Instead of a normal flat bushing seat, we have made ours dished. When correctly tightened the bushing compresses into the dish creating a preload. This load makes the truck snappier and more responsive, while also making them much more stable and solid when turning. This is because the bushing is completely touching the hanger for a longer amount of time when you are leaning. The walls of the bushing dish have also been brought in closer to add compression at the end of your lean, preventing wheel bite and over steer. The new dish has really made the Katana feel much cleaner and smoother through the range of the trucks action. 1 x Precision Kingpin nut. These are compatible with both precision and cast model trucks from Ronin. The 42° baseplate is a cnc-machined race plate compatible with Vapor, Stream7, MSpec and Vertex. The kingpin is a press-fit resulting in no slop. big SKOA urethane pivot cups = more dampening, more support, more durability. We hand pour these our self in 90a. Price is for 1 single baseplate. The Vertex fills the gap between M.Spec and Stream7. It is our newest addition to the SKOA family and blends race winning characteristics to give great stability during high speed, smooth sliding, good control over grip and less hard hookup than the M.Spec. The SKOA I-Beam design gives this truck its unique look and ensures maximum strength at minimal weight. I-Beam design = the greatest weight reduction without sacrificing strength. Slight positive rake = +1.5mm positive rake. Germany has been producing top of the line cars for years. Now you can ride top of the line German trucks! Big Urethane Pivot Cups = More dampening, more support, more durability. We hand pour these our self in 90a.